The NFL honored former Patriots lineman Joe Andruzzi for his efforts helping victims at the Boston Marathon attack during the draft. He was supposed to announce the Patriots’ pick, but instead announced the team had traded its selection to Minnesota. FOXBOROUGH — The Patriots entered the NFL draft with five picks, starting with the 29th selection in the first round. It was a situation that seemed tailor-made for Bill Belichick, the master of draft weekend trades. New England wanted more picks, and at least one team would be looking to get back into the first round. All that was left to be determined was how badly that team was willing to surrender. A little over three hours into the draft, New England had its answer. Minnesota was willing to give up a whopping four picks – in the second, third, fourth, and seventh rounds — to get No. 29. The Vikings used the selection (their third of the first round) on Tennessee receiver Cordarrelle Patterson, who is an explosive playmaker but only played one year for the Volunteers after two years in junior college. But the trade is done now, and it doesn’t matter to the Patriots if Patterson doesn’t pan out. What does matter to Belichick and his staff is that they picked up the 52d, 83d, 102d, and 229th picks; and for now, five picks have become eight. The slots are added to New England’s other picks: 59 (second round), 91 (third), 226 and 235 (seventh). Director of player personnel Nick Caserio met with reporters as the first round ended — he jokingly asked what there was to write about — and said as the Patriots’ pick approached, they started getting a few more phone calls from teams before hammering out the deal with the Vikings. “This was an opportunity we thought made sense for us, it was an opportunity to add more players to our team,” Caserio said. “We feel there are a lot of good players that are still available. We picked up a pick in the second round, picked up a pick in the third round, a fourth-rounder, which we didn’t have, and a seventh-round pick, which we required as a part of it as well. “In years past those [picks in Round 7] have been pretty valuable. We took [Alfonzo] Dennard, we took Julian Edelman, we’ve taken guys like that. Former Patriots guard Joe Andruzzi, who carried an injured woman to safety after the Boston Marathon explosions, displayed a jersey with the city’s 617 area code and ‘‘Boston Strong’’ written on the front while posing with NFL commissioner Roger Goodell at Radio City Music Hall. 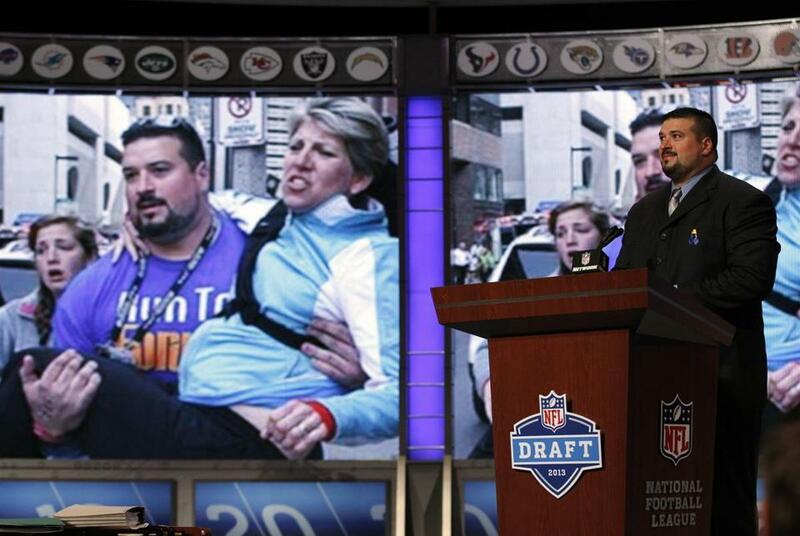 Andruzzi was supposed to announce New England’s pick. Andruzzi, a native New Yorker, told the crowd, ‘‘There’s a new saying in Boston: Boston Strong’’ before unveiling the jersey as ‘‘Sweet Caroline’’ was played on the loudspeakers. If the trade had not come to pass, New England had players in mind it would have taken at No. 29. And “a few” of those players the Patriots were considering were not drafted on Thursday, Caserio said. Thursday night’s deal may allow them to move up for one of them. And there is always the possibility of getting value — one of the Patriots’ favorite buzzwords around draft time. “I think we feel that there’s players sort of littered throughout this draft, certainly there’s a number of good football players that are still up on the board,” Caserio said. The Patriots considered this a deep draft for offensive linemen, and Caserio said they figured seven or eight linemen would be taken in the first round. The number turned out to be nine. He added there were not many surprises on which players heard their names called, though it is almost impossible to predict the order in which they would be drafted. Eleven front-seven players and seven defensive backs were among the first 32 selections. The second and third rounds will be held beginning Friday at 6:30 p.m.
Rounds 4-7 begin Saturday at noon. Shalise Manza Young can be reached at syoung@globe.com. Follow her on Twitter @shalisemyoung. Material from the Associated Press was used in this report.